The St. Louis Cardinals selected University of Hawaii second baseman Kolten Wong with their first overall selection in the 2011 First Year player draft. Wong has also started games at second, catcher and centerfield during his time at Hawaii. runs and 145 RBI, while posting a career slugging pct. of .563 and on-base pct. of .449. A left-handed hitter, Wong profiles as an above average hitter and a smart runner on the base-paths who stole 53 bases in 71 attempts during his college career. He is a three-time First-Team All-WAC, selected to the WAC All-Tournament team, he was named the Most Outstanding Player of the 2010 WAC Postseason Tournament, MVP of the Cape Cod summer league and a two time Louisville Slugger Postseason All-America Team selection. fielding pct. (89 po, 139 assists, 11 errors). He led his team in almost every offensive category during the 2011 season, including average (.378), slugging (.560), on-base percentage (.492), hits (79), RBI (53) and home runs (7). He stole 23 bases during the season and led the club with 27 multi-hit games and 13 multi-RBI games. 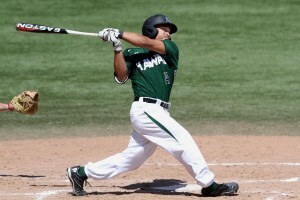 During the Western Athletic Conference tournament this season, he hit .412 (7-17) with one home run and five RBI and was named the WAC tournament MVP in 2010, as he helped Hawaii to their first title since 1992. Twins, but did not sign. He played on the USA Baseball National team in the summer of 2008.